The Diamond Way Buddhist Center in London has been in a small house in the Holborn area of London for more than a decade. Now, Diamond Way Buddhism UK has received planning permission to renovate a wonderful building called the Beaufoy Institute in the Lambeth area in south London and transform it into our new Buddhist center. Written by the London Diamond Way Buddhist center. This move is the single most exciting development in the history of Diamond Way Buddhism in the UK. 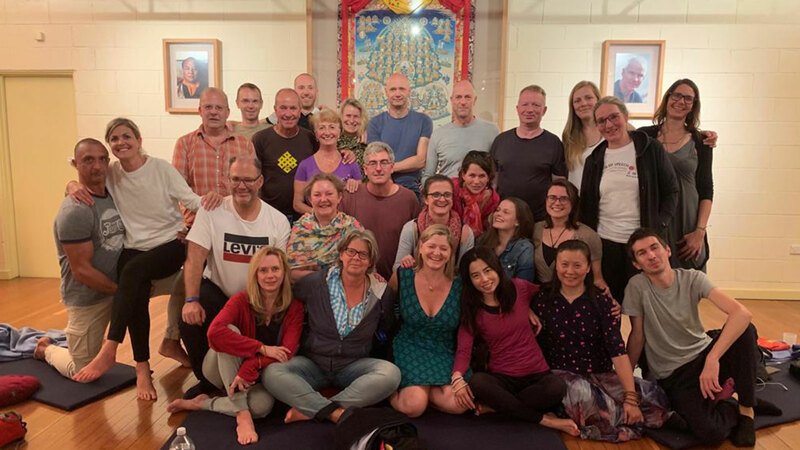 Started in 1994 by a young Cambridge graduate by the name of Steve James, fresh from an encounter with Lama Ole Nydahl in Japan, and a few friends, Diamond Way Buddhism UK has grown steadily. Now we have 19 Diamond Way Buddhist centers and groups in the UK. They offer Buddhist meditation courses, retreats, Buddhist teachings, and the opportunity to meet our Karma Kagyu lamas. 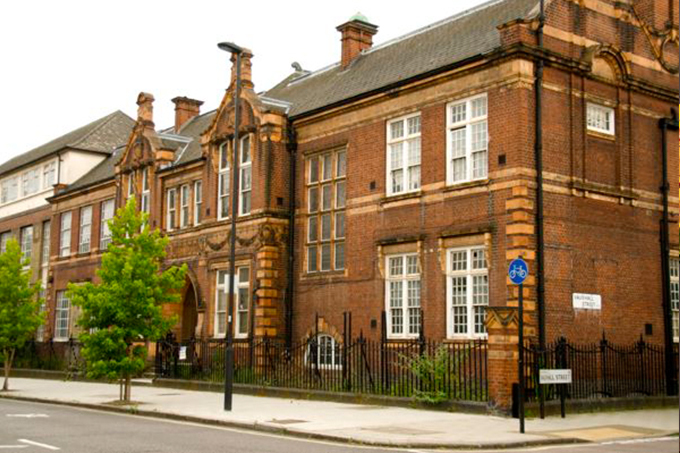 The historic Beaufoy Institute has been owned and managed by Lambeth Council and the Beaufoy Trust for 14 years while vacant. The Institute, or “the Beaufoy”, as it is affectionately known by the London Buddhist Community, is a Grade II listed building (and its beautiful appearance is therefore protected by law), and an important part of Lambeth history. It was built on Black Prince Road in 1907 by the Beaufoy family as a so-called Ragged School, to give disadvantaged children a well-rounded education. The Beaufoy family were involved in several philanthropic and charitable projects, and in this spirit of providing long-term benefit for others, a transition into a Buddhist center continues this ethos. The purchase itself will release funds for the Beaufoy Trust and Lambeth Council to invest in the local community further. The Diamond Way Buddhist Center in Lambeth will be a welcomed addition to the existing Buddhist centers already established in the South London area, and has already generated keen anticipation amongst South London’s Buddhist community. In moving to Lambeth from its present location in the center of London, the Buddhist center will leave behind many fond memories. Founded in 1997, the London Diamond Way Buddhist Center has hosted many of the greatest lamas of the Karma Kagyu lineage several times. His Holiness 17th Karmapa Trinley Thaye Dorje visited London in the summer of 2012 for the fourth time, and together with the General Secretary of the Karma Kagyu School Lama Jigme Rinpoche, Lama Ole Nydahl and Lama Jampa Thaye, took a tour of the Beaufoy Institute. Our success to date has been due to the hard work of too many people to thank individually. It is also due to the local support for the project from the Lambeth community. Diamond Way representatives met with community groups including the Kennington, Oval, and Vauxhall (KOV) Forum and held a number of planning consultation sessions to listen to the local community and gather ideas for how the community would like to connect with the Beaufoy and Diamond Way Buddhism. To introduce itself, Diamond Way also held an exhibition of Buddhist and contemporary art called “Space for Art – Space for Mind” that involved local artists and national works from the British Council Collection. The community shared its overwhelming support when on Tuesday 3rd July 2012, over 100 people from diverse backgrounds and walks of life assembled to support the application at the Planning Application Committee meeting of Lambeth Council. The application was successful with 5 Lambeth councilors supporting the project to one abstention. A project of such obvious, long-lasting benefit as the building of a Buddhist center naturally attracts support and brings out the most selfless and creative streak in people. To fundraise for the project, members of the Buddhist center threw themselves out of planes on skydives (an excellent way to check one’s level of fearlessness, which is supposed to result from Buddhist meditation! ), hiked up mountains, and went on long-distance cycle rides, all while getting sponsored for Diamond Way Buddhism UK. But it wasn’t all about money. One great thing about being part of such a worldwide network is that you can always ask for advice from others who have probably done just what you want to do. 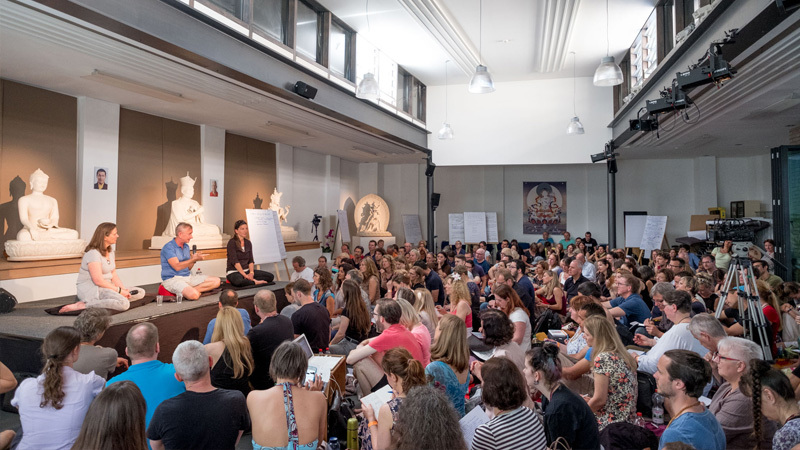 In order to buy, plan for, and build a great, well-functioning Buddhist Center, integrated into the London community and providing maximum benefit, we would need a lot of good, well-tested ideas. 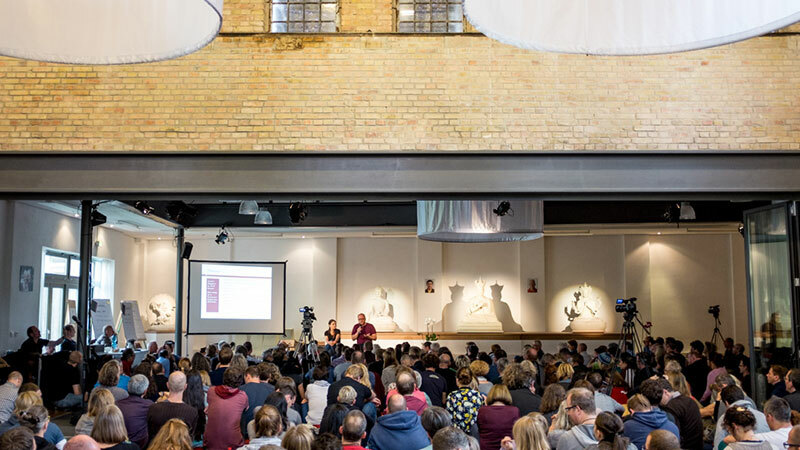 So we set out to ask other Buddhist centers who had done just that, on our world-famous London Roadshows. Among the many, many wonderful experiences we had (too many to mention), we went to the Hamburg Buddhist Center, where we learned a lot about how to manage a large center; we went to the Budapest Buddhist Center, which is right now in the middle of a huge renovation project, and we will go very soon to the Brno Buddhist Retreat Center, where we will learn how they organize Buddhist meditation retreats. Renovation works are planned to begin early in 2013. The plan is to have a functioning hall where we can offer Buddhist meditation to the public and residential accommodation within a few months. The meditation hall will eventually be able to host lectures of visiting Buddhist teachers, with plenty of space to meditate. Many long-term residents, as well as short-term visitors, will be able to stay in the Beaufoy. And the Buddhist center will play an active part in the local community. Please check the Beaufoy Blog for plans, updates and progress, and do come and visit!